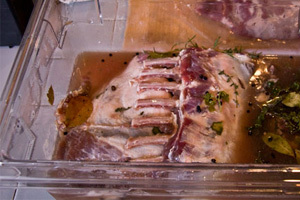 Brining is an easy technique that gives you a more moist finished dish while also imparting additional flavor. It’s a particularly good idea when working with pork, lean game meats like wild boar, and poultry. 1. Mix up a brining solution (see below for ratios). Bring it to a boil. 2. Cool the solution to at least room temperature. 3. Submerge your meat or poultry in the solution in a coverable container. If using a zip top bag, we recommend placing the bag in a bowl in case it leaks. 4. Store the brining food on the lowest shelf in your refrigerator overnight. 5. Remove the food from the brine, rinse off the surface, and cook it. If using a recipe that does not normally call for brined poultry or meat, reduce the amount of salt in the recipe to account for the salt that has been absorbed by the meat. 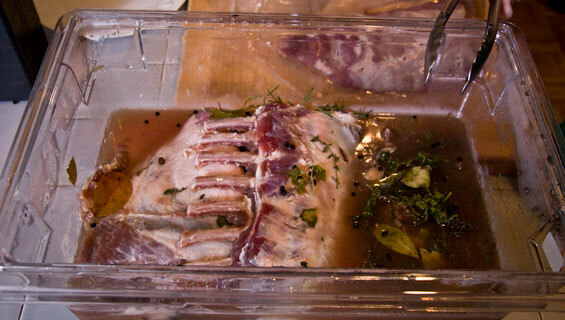 Your brining solution should contain 1/2 cup of salt for every 8 cups of water you use. 1. In a large pot, combine half the water with all the other ingredients. 2. Bring the brine to a boil, and boil for one minute. 3. Add the rest of the water (to dilute and cool the brine). Let the brine cool completely before use. Again, this is just an example. The important constant is the salt & water ratio, beyond that you can use any combination of whole spices, fresh herbs, and other sweeteners you want. We particularly recommend: fresh rosemary, tarragon, fresh sage, and brown sugar. We’re terribly sorry that happened! I’m going to look into the recipe immediately to fix the ratio problem. In addition, I’ve opened a case with our service team about your racks – they’ll be reaching out to make it right. Anytime you brine, you need to rinse the surface salt off before cooking. It won’t be inedible that way. That’s a great point Patti. Looks like I left that step out. I’ve updated the post. Thank you!